Mouse B7-1, Fc Tag (CD0-M5259) is expressed from human 293 cells (HEK293). It contains AA Val 38 - Lys 245 (Accession # Q00609-1). The protein has a calculated MW of 50.3 kDa. 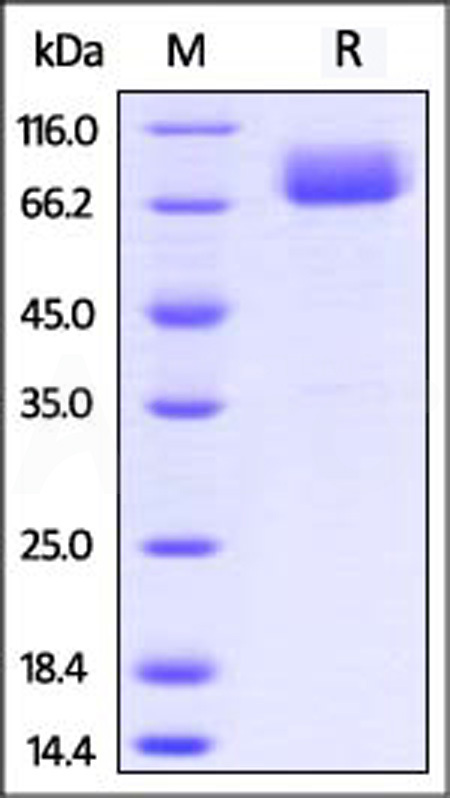 The protein migrates as 66-90 kDa under reducing (R) condition (SDS-PAGE) due to glycosylation. 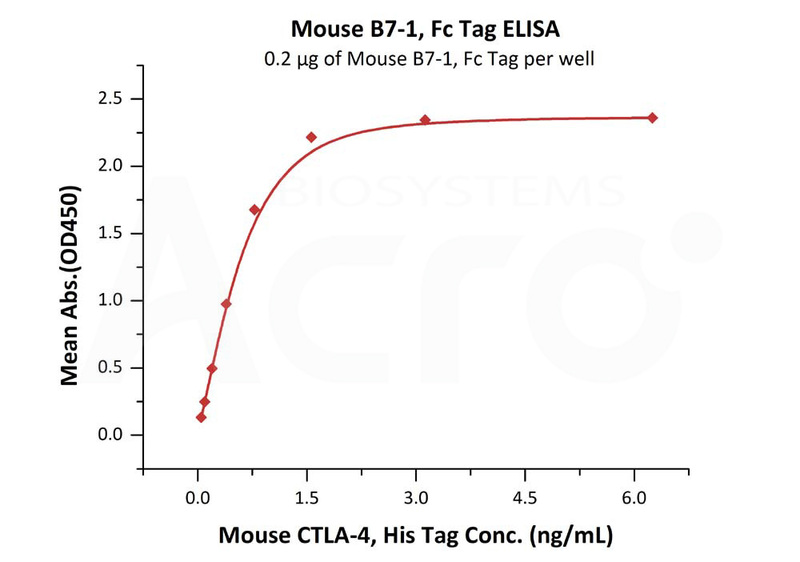 Mouse B7-1, Fc Tag on SDS-PAGE under reducing (R) condition. The gel was stained overnight with Coomassie Blue. The purity of the protein is greater than 95%. Immobilized Mouse B7-1, Fc Tag (Cat. No. 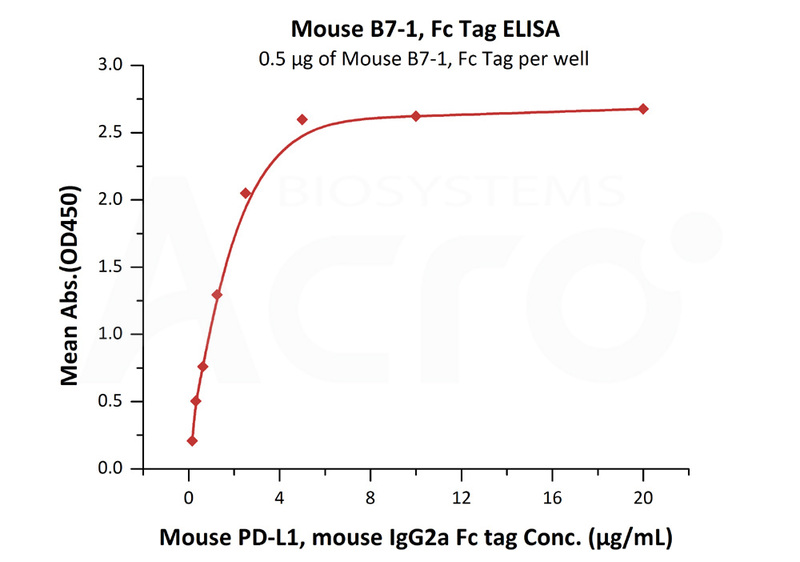 CD0-M5259) at 5 μg/mL (100 μL/well) can bind Mouse PD-L1, mouse IgG2a Fc tag, low endotoxin (Cat. No. PD1-M52A2) with a linear range of 0.16-2.5 μg/mL (Routinely tested). (1) Peach RJ., et al., 1995, J. Biol. Chem. (UNITED STATES) 270 (36): 21181–7. (2) Stamper CC., et al., 2001, Nature (England) 410 (6828): 608–11. (3) Bhatia S., et al., 2005, Proc. Natl. Acad. Sci. 102: 15569-15574.